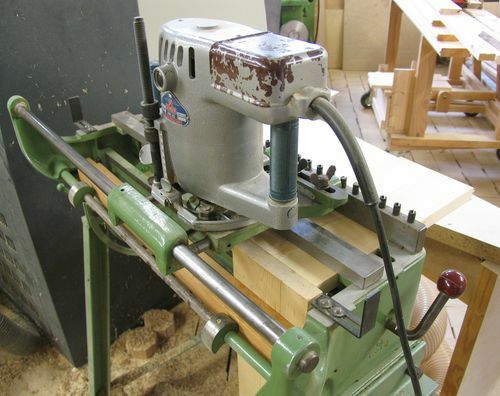 I really like Kurt's SCHEER dovetailing machine. 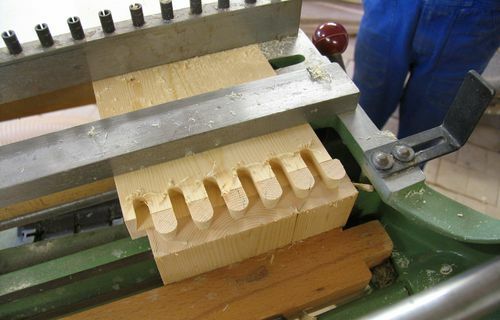 Unlike a typical cheap dovetailing jig, this machine doesn't rely on a guide bushing around the router bit to guide the router. I always find it so fiddly to make sure the router is held flat against the guides when using a dovetailing jig - I just never feel certain that the cut is going well. 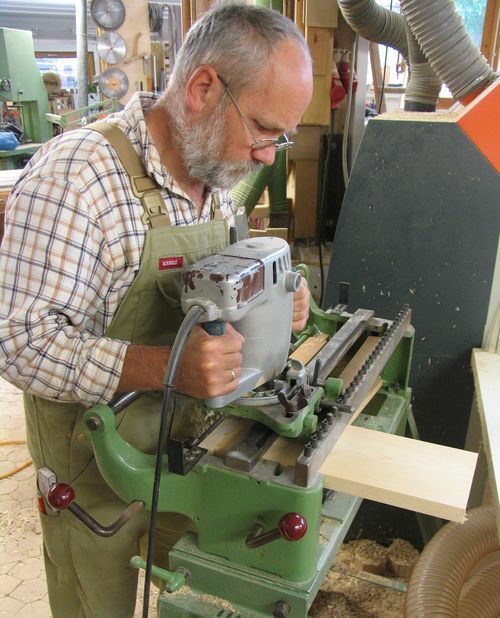 Kurt's cast iron dovetailing machine is a refreshing change from the usual jig. The router is actually an integral part of the machine. Guiding the router is accomplished by a set of pins away from the cutting head, but easily observed, so it's easy to make sure that the whole curve is being traced out by the cut. The router itself is quite heavy, with a cast aluminum housing. The label on the router says "SCHEER". That name is also part of the cast-iron casing of the machine. The machine is one of those older German woodworking machines, probably from the 1960s, before globalisation hit the industry. There's not an English word on the whole machine. 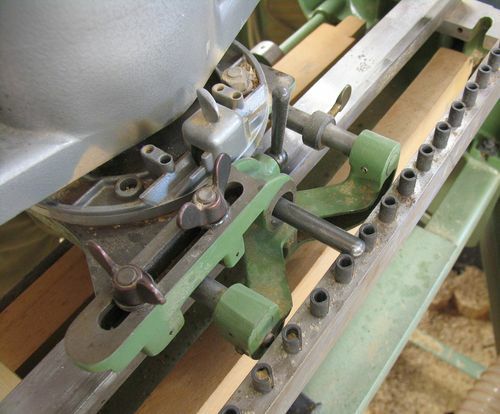 The pin sticking out from the left, along with the row of hollow pins along the rail on the right are the guide for this dovetailing machine. The pin from the left moves with the router, and hits the fixed set of pins on the right. 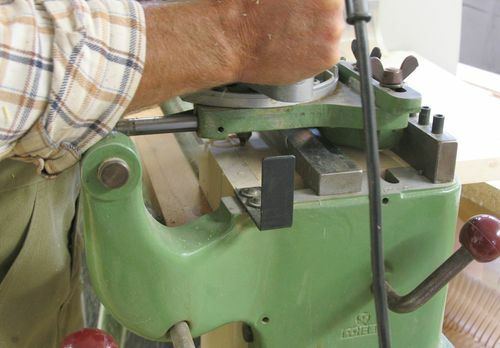 Together, these two parts guide the router to form the rounded ends of a dovetail joint. The wing nuts towards the bottom left of the picture can be used to move the position of the pin relative to the router, and the pin itself can be moved forward or back by loosening a lever on the bracket holding the pin. 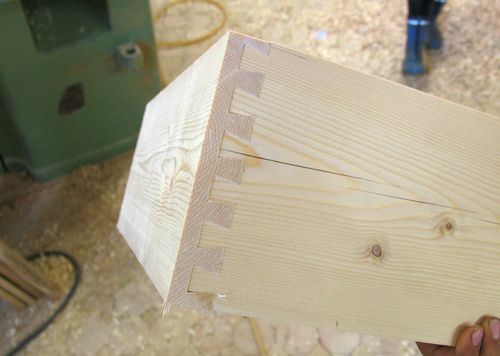 The idea is that if you want to vary the relative location of the dovetails in your wood, you move this pin, not the wood. With the mechanism to guide the router well away from the work piece, there is lots of room around the router bit. This makes it easier for the wood chips to escape, so clogging up is less likely. Notice the label "SCHEER" in the casting on the bottom of this picture. A company name cast into the casting is another thing you don't see much anymore. With so many machines sold under multiple brand names these days, the company name is always on a label, or painted on, so that the same mold can be used for different brands. After cutting the dovetails, with the pieces still in the machine. And the same joint, assembled. Kurt uses a lot of dovetail joints. With the machine always set up and ready for another cut, it's very convenient to just use dovetail joints for the corners of his boxes.